The Minnesota Gophers overcame a furious Wolverines rally to topple Michigan 83-78 at home. MINNEAPOLIS — Losers of five straight games in January, the Minnesota Golden Gophers were in desperate need of a rebound. Jordan Murphy and the Gophers big men got almost all of them against Michigan on Sunday night to keep them steamrolling toward an NCAA tournament berth. 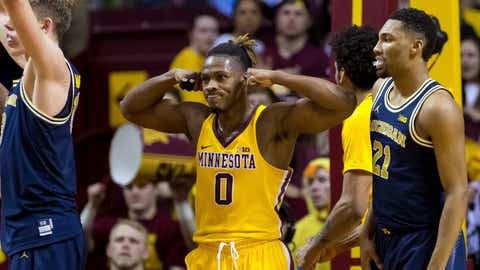 Murphy had 16 points and 15 rebounds and Eric Curry scored all 12 of his points in the second half to lift Minnesota to its fifth straight victory, 83-78 in overtime over Michigan. The Golden Gophers (20-7, 8-6 Big Ten) out-rebounded Michigan 44-31, including 13-3 on the offensive glass, and outscored Michigan 19-0 in second-chance points to hold off a furious rally in their fifth overtime game of the conference season. “We’re becoming a tough basketball team right in front of everyone’s eyes,” Minnesota coach Richard Pitino said. Derrick Walton Jr. scored 10 of his 16 points in the final five minutes of regulation and D.J. Wilson added 16 points, including the tying 3-pointer with 1.8 seconds to play in regulation, for the Wolverines (17-10, 7-7). But Michigan missed nine free throws. The Wolverines have struggled on the glass for much of the season. Facing a decided size disadvantage against Minnesota, they focused on other areas to try to pull out their second road win of the season. With his father, Louisville coach Rick Pitino, sitting a few rows behind him in the stands, Richard Pitino led the Gophers to their first victory over Michigan in 10 games, the latest positive development for a program that has quickly put last year’s 2-16 Big Ten season behind it. After blowing an eight-point lead with just over two minutes to play in regulation, Murphy threw down a thunderous putback dunk with two minutes to go in overtime that pushed the Gophers ahead. Dupree McBrayer scored 15 points and Reggie Lynch added 11 points and eight boards in 13 minutes. Michigan: The Wolverines have been a different team on the road all season, and not for the better. They’ve beaten the likes of Wisconsin, Michigan State and Texas at home, looking like a sure-fire NCAA tournament team with an intriguing mix of athleticism and 3-point shooting. But the loss at Williams Arena dropped them to 1-7 this season away from home, with the only win coming at imploding Indiana last week. Not a good sign when there is no home cooking in March. Minnesota: The Gophers have since righted themselves in impressive fashion after a January swoon. They have beaten Indiana, Michigan and Iowa during this winning streak to bolster an NCAA tournament resume that was already strong with an RPI in the top 25 and a strength of schedule in the top 20 in the country. The Gophers shot 41 free throws to Michigan’s 18 and made 15 of their last 16 to hold off the Wolverines. With Minnesota clinging to a 58-57 lead and 4:39 to play, the Michigan bench was given a technical foul after Beilein stomped his foot furiously on the sideline in reaction to a foul call. That jump-started a 10-3 run that put the Gophers up 68-60. The Wolverines closed regulation with a 12-4 surge, getting a three-point play from Walton and a deep 3 from Wilson that tied the game just before the end of regulation. Walton thought they were headed to a second OT when he let another 3 fly with less than 2 seconds to play. Michigan: Visits Rutgers on Wednesday. Minnesota: Visits Maryland on Wednesday.